I recently unearthed this ancient photo - taken by myself in 1974 or 1975 - from a CD-ROM disk that I was about to throw out. It depicts the Belmore Cafeteria, on 28th and Park Avenue South. The Belmore is, sadly, one of New York City's great Lost 24-Hour Institutions. In some ways, the Belmore was better than the Web will ever be. Forget broadband - the Belmore had breaded veal! It was cheaper than AOL (observe the ads for a "$0.50 Inflation Stopper Sandwich"). And it was always busy. even at 4 in the morning, filled not with Virus writers, Asian Teens, and Internet Cannibals, but with the sort of supremely twisted New York Night People that Jean Shepherd talked about in the early 1960's and Martin Scorsese immortalized in a scene from 1976's Taxi Driver in which Wizard (Peter Boyle) fails to ease the mind of Travis Bickle (Robert De Niro) "in the blood-red light of an outside neon sign". (you can clearly see this sign in the photo, although Bickle and Wizard are missing). 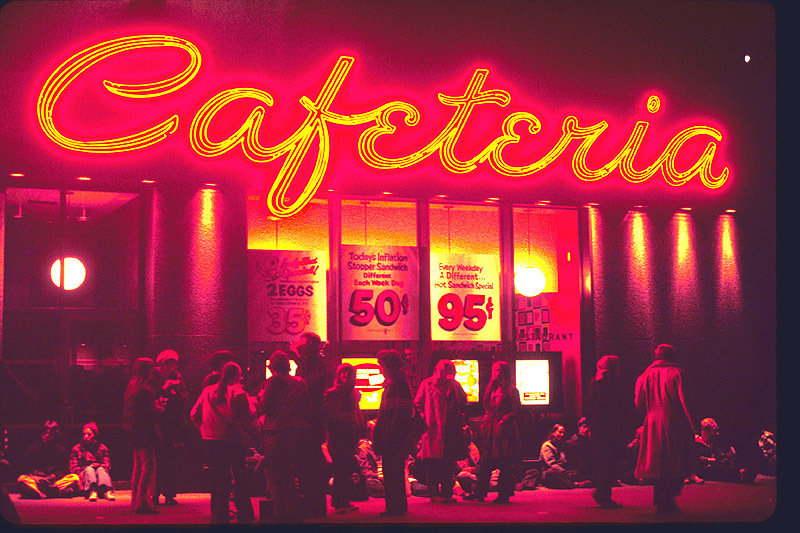 Taxi Driver made the Belmore Cafeteria world famous, but unfortunately, this noble staple of '70's Low Rent Night Life closed in the early 1980's, when Manhattan real estate prices began to crawl upward, prompting its owners to sell out to developers of a sliver-shaped residential high rise. New York changed, I stopped walking the streets at night with a camera, the Web was invented, and all of the young people in this photo - in just a few instants, it seems - became old, although most are still too young to have joined the $0.35 2-Egg Special in the dustbin of history. Today, one's Orpheus-like journey through the Stygian underworld begins and ends within the confines of one's browser. Yes - time unravels, erodes and erases everything (except, perhaps Hard Times, which for many people are as real now as they were in the 1970's), but this image, and, of course, Scorsese's film, are capable of bringing me back to the Belmore - for one last $0.50 Inflation Stopper Sandwich at 4:00 AM.